Kyabje Bokar Khenchen Lodoe Thonyor Rinpoche was born to a poor family. At the age 12, he was sent to Bokar Monastery, and worked as a mess cook and shepherd. He was eager for learning and grasped every opportunity for study even though he was illiterate at that moment. His wisdom emerged rapidly. He always studied texts (books) attentively and was able to memorize the texts. In every stage of his life as he grew up, Khenchen Lodoe Thonyor Rinpoche never complained and always treated people kindly. After arriving India with Kyabje Bokar Rinpoche, Khenchen Lodoe Thonyor Rinpoche spent five years studying Tibetan literature and English in a Tibetan Institute in Darjeeling. He always came out first in his class during the annual examinations. Then, he went to Sanskrit University in Varanasi and completed a nine-year academic program and passed with first division. Due to his outstanding academic achievements, the Tibetan Government in Exile offered him a position of Principal of a secondary school. Khenchen Lodoe Thonyor Rinpoche declined the offer and chose instead to return to Sonada Monastery in Darjeeling and joined Kyabje Bokar Rinpoche. In Darjeeling, he was given the title of “Khenpo Rinpoche” by HH 16th Karmapa to mark his great achievement of Dharma studies and practice. In Sonada Monastery, Dorje Chang Kalu Rinpoche had bestowed teachings on a great number of profound Tantras and related practices on Khenchen Lodoe Thonyor Rinpoche . Khenchen Lodoe Thonyor Rinpoche is a renowned scholar, not only for his knowledge but also for his compassion and accomplishments of Dharma practice. Khenchen Lodoe Thonyor Rinpoche has written many profound commentaries and books. One of his works, an elaborate commentary on the Tantra of Kalachakra, earned him His Holiness Dalai Lama’s acclaim. Khenchen Lodoe Thonyor Rinpoche is the main spiritual successor of Kyabje Bokar Rinpoche. He had been Kyabje Bokar Rinpoche’s attendant for more than fifty years. He received all the precious teachings in its entirety from Kyabje Bokar Rinpoche. 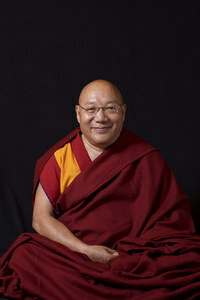 After Kyabje Bokar Rinpoche passed into Parinirvana, Khenchen Lodoe Thonyor Rinpoche assumed the responsibilities of educating HE Yangsi Kalu Rinpoche and a vast number of ordained and lay disciples regard him to be their guiding light and refuge.